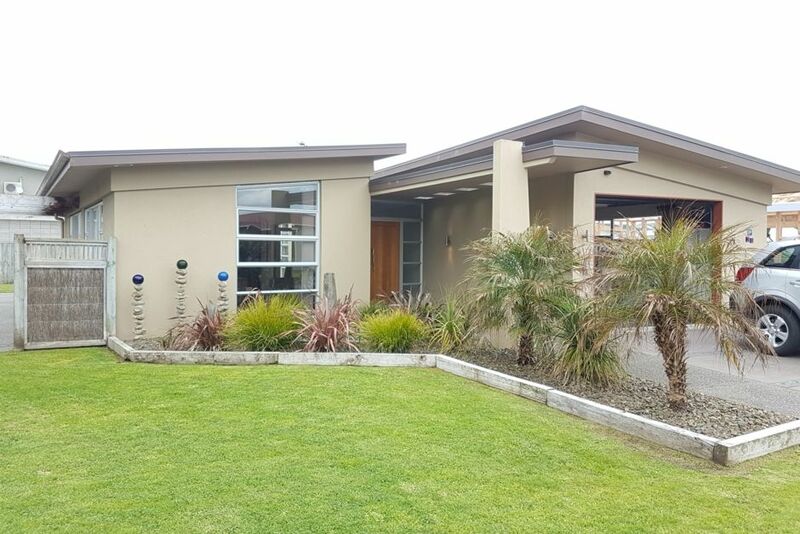 This relatively new modern upmarket Moore Living house is situated in a quiet cul de sac (new subdivision). It is a very short stroll from Buffalo Beach and has magnificent rural views facing north. There is a large private outdoor entertainment area, which includes an outside table/chairs and a BBQ. This outdoor entertainment area is very sheltered and has a shade cloth set up for those wanting to escape the excessive heat. Kitchen: Very modern open plan, complete with granite top benches, gas hob, double electric oven, microwave, fridge freezer, and dish washer. All appliances, cutlery, etc, are supplied with this beautifully decorated kitchen. Lounge/Dining: The living room has views towards the Coromandel Ranges with good outdoor flow through larger ranch sliders. Family Room: Perfect for the children or as a second lounge (including extra TV). This room has ranch sliders leading to the outdoor entertainment area. Bedrooms: One master bedroom (queen size bed) with ensuite, and 2 twin bedrooms (2 single beds in each room). All bedrooms have built in shelved wardrobes. There are additional mattresses stored in the garage to allow 2 extra beds to be made up. Bathroom: Very modern design with shower and bath. Seperate room for toilet. A fish cleaning bench is located outside next to an area to store your boat. If you wish to use the cleaning service, this will cost you $60. You should inform the house owner that you require this cleaning service before the commencement of your rental period. Note: This cleaning service is recommended by the large majority of people as they are there for a holiday. NOTE: Under Kiwi bach tradition you are expected to bring your own linen (towels/sheets/tea towels). 1 in the Living Room and 1 in the Family Room. Freebox. Lovely home. In a quiet location. Enjoyed our stay. Hosts were good with communication. A lovely home, in a very quiet location. Enjoyed our stay. And hosts were very good with their communication. We three brothers in our 70s and our wives came from Australia for a reunion of sorts in Whitianga. We stayed in this house for two weeks and had a fabulous time. It was really well suited for our purpose - spacious, comfortable and well equipped, and enabled us to entertain friends on a couple of occasions. Perfect for our needs. Our only small concern was the beds (hence only 4* rather than the five this house deserves). While the bed in the master bedroom was fine, the small, rubber mattressed single beds in the other two bedrooms weren’t particularly suitable for us oldies to use for a longer period. For kids or for a short stay they are fine, but not so great for our purposes. Similarly, the chance for an extra couple to sleep in the “annex” was not practical for older people. I’m sure that the mattresses provided would be comfortable, but the area was too public to be used by a guest of ours. Perhaps in the garage? I repeat though, that this was a minor niggle and did not detract from our wonderful holiday in Maison Whitianga.